Values like leadership, a global mindset, resilience, and entrepreneurship don’t come from reading. They are developed by doing. Engage: Real-world experience with external entities or immersion in complex contexts is vital for experiential learning to take place. Reflect: Participants regularly reflect on the experience, actively incorporating feedback to further grow their professional skills. Excel: Students experiment with new approaches to develop and practice important competencies. Each experience will prepare students for the business world after they graduate. 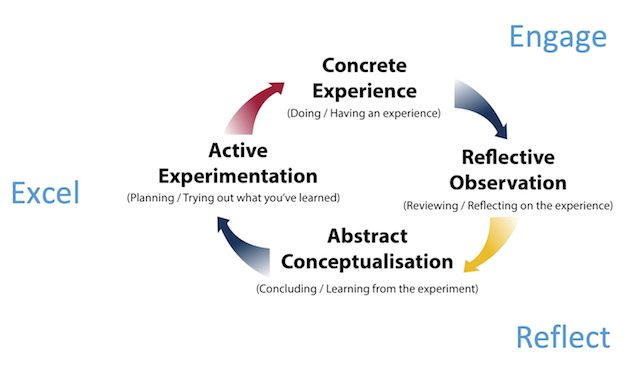 * The Carey Experiential Foundation is based off David Kolb's Experiential Learning Cycle. Teaming: Developing effective teams that nurture trust, encourage intellectual curiosity and productive debate, commit to the engagement, embrace accountability, and remain focused on the goals of the project. Context: Each project will engage external partners in real-world scenarios so students can learn how to navigate complex organizational cultures and structures as well as external and internal influences. Engagement: When working with external partners, students commit to developing pragmatic, actionable recommendations through collaboration with each partner. Efficacy: Teams effectively address challenges by developing and deploying a resilience mindset that adjusts with the changing requirements of the project and generates creative solutions. Innovation: Teams develop novel, effective ideas tailored to the context of the engagement. Delivery: Projects conclude with the team delivering its recommendations to the project partners. Deliverables include a clear explanation of the methodology, recommendations for solving the challenge, and an implementation plan to put the recommendations into action.